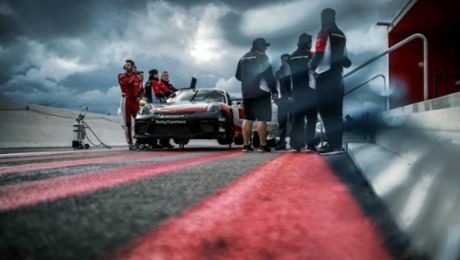 Porsche is expanding its successful and sustainable youth development programme in international motorsport. In 2018, four Young Professionals will be sponsored on the international GT racing scene. Two Porsche Juniors will receive training to become a professional racing driver in the Porsche Mobil 1 Supercup, which features on the same bill as Formula 1. Norway’s Dennis Olsen and Australian Matt Campbell will be supported in the future as Porsche Young Professionals in international GT racing. The Porsche Young Professionals squad also includes Matteo Cairoli from Italy and Frenchman Mathieu Jaminet. Thomas Preining from Austria makes the step up from the Porsche Carrera Cup Deutschland to the Porsche Mobil 1 Supercup, where he will be supported as a Porsche Junior. Porsche Motorsport will also support Julien Andlauer as a new Porsche Junior. The Frenchman came through an international trial and will also race in the Porsche Mobil 1 Supercup in 2018. “All our young racing drivers have developed superbly in 2017. The one-make cups, in particular, have proven to be an outstanding springboard for the Porsche Juniors,” said Dr. Frank-Steffen Walliser, Vice President Motorsport and GT Cars. Olsen won the title in the 2017 Porsche Carrera Cup Deutschland. The 21-year-old from the Konrad Motorsport team demonstrated a particularly impressive level of consistency. As well as six race wins, the young driver from Våler in Norway also finished on the podium in 12 of the season’s 14 races. Olsen also demonstrated his talent in the international Porsche Mobil 1 Supercup, in which he drove for the Walter Lechner Racing Team. The youngster was victorious at the iconic British circuit in Silverstone, as well as the double-header at Spa-Francorchamps (Belgium). He ended the season second in the championship and was crowned top rookie. Having been supported for two years as a Porsche Junior, Olsen can now look forward to outings on the international GT customer racing scene as a Porsche Young Professional in 2018. Campbell contested his debut season in the Porsche Mobil 1 Supercup in 2017. This was the 22-year-old’s first year in European motorsport. Prior to that, the young man born in Warwick (Queensland) had done his racing in single-seater Formula cars, as well as national Porsche one-make cups in Australia. Campbell lined up for the Fach Auto Tech team in the Porsche Mobil 1 Supercup, and finished runner-up in the rookie competition. After eleven races, he ended the season in third place in the overall standings. The Porsche Junior won four races, in Spielberg (Austria), Monza (Italy) and the double-header in Mexico City. Promotion to Porsche Young Professional means Campbell is now ready to take the next step in his motorsport career. Porsche Motorsport will also support Cairoli as a Porsche Young Professional in 2018. The youngster spent the 2017 season at the wheel of a 2015 Porsche 911 RSR run by Porsche customer team Dempsey Proton Racing in the FIA World Endurance Trophy, in which he finished runner-up. The 21-year-old won the GTE-Am class at the Nürburgring and in Mexico City. He also finished sixth in this class at the 24 Hours of Le Mans. The driver from Como, Italy, also impressed at the 24 Hours of Dubai: Cairoli and Manthey Racing came home second at the most prestigious sports car race in the United Arab Emirates. Mathieu Jaminet completes the Porsche Young Professionals squad. The 23-year-old lined up in the ADAC GT Masters for KÜS Team75 Bernhard. Driving a Porsche 911 GT3 R, Jaminet took the chequered flag in Oschersleben and was runner-up at the Nürburgring. The driver from Woippy, France, also started selected races in the Pirelli World Challenge for the GMG Racing team. Jaminet, at the wheel of a Porsche 911 GT3 R, won the GT-X Pro-Am class in the races at the Utah Motorsports Campus (Utah) and the Circuit of The Americas (Texas). He also gained his first experience of the IMSA SportsCar Championship with Alegra Motorsports. Thomas Preining is also making a step up in the world of motorsport, and will drive in the Porsche Mobil 1 Supercup in 2018. He receives 225,000 Euros in funding from Porsche Motorsport as reward for his promotion. Preining contested his first season in a GT Racing car in the 2017 Porsche Carrera Cup Deutschland. The Porsche Junior won the final race, at the Hockenheimring in Baden-Württemberg, and finished third at the Norisring. This was enough to earn the 19-year-old from the Konrad Motorsport team second place in the rookie competition. Preining also won the invitational race in Porsche Carrera Cup Deutschland, which was held on the same bill as the World Endurance Championship (WEC) at the Nürburgring. The young driver gained his first experience in the Porsche Mobil 1 Supercup in Budapest, Monza and Mexico in 2017. His best result came at the Autódromo Hermanos Rodríguez in Mexico, where he crossed the finish line in fifth place. Julien Andlauer will also receive comprehensive support from Porsche Motorsport in 2018. The new Porsche Junior will benefit from 225,000 Euros of funding in the Porsche Mobil 1 Supercup. Andlauer won seven races en route to the title in the 2017 Porsche Carrera Cup France. 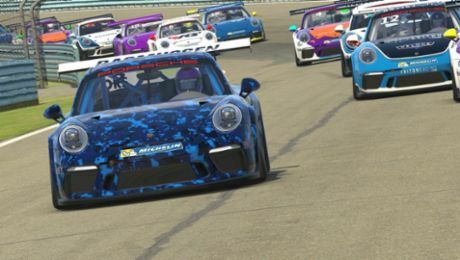 On the back of this success, the 18-year-old was nominated by the national one-make cup to take part in a two-day trial at the Lausitzring, at which high school graduate came through against eight international candidates to earn a grand for the Porsche Mobil 1 Supercup. Andlauer made his debut in the international one-make cup at the season finale in Mexico City. After qualifying sixth, the driver from Sainte-Foy-lès-Lyon crossed the finish line in fifth place. Who will be the new Porsche Junior for the 2016 Porsche Carrera Cup Deutschland?